In November of 2003, the NBA’s board of governors emerged from a smoke-filled room with a plan to realign the league’s divisions. The archaic four-division format, in which the Atlantic, Midwest, and Pacific Divisions had seven teams, while the Central Division went rando-style with eight, was scrapped. The NBA made its triumphant return to Charlotte with the addition of the Bobcats (RIP), bringing the league to a pleasantly round-numbered 30 teams, which allowed it to go to a mostly geographically sensible (shouts to New Orleans in the Southwest!) six-division/five-team format. Teams would now play each divisional opponent four times (two home, two away), non-division conference opponents either three or four times, and opposite-conference teams twice. Each division winner would automatically make the postseason and garner a top-three seed, depending on its regular-season record. These things surely are cyclical. Unfortunately, the cycle has been more like the movement of glaciers and the birth and death of planets than fall turning into winter. Today, the disparity between East and West is worse than ever before, and no division symbolizes the yawning gulf in class between the conferences like the ever-beleaguered Atlantic. In the 10 full seasons since realignment, the Atlantic Division has finished the season with a winning percentage over .500 only one time: the 2012-13 season, during which a shockingly lively 54-win Knicks team drove the division’s cumulative winning percentage to .517. That stat looks even worse when you consider that the Celtics won more than 60 games twice during that stretch, including a successful title run. Over that same time, the Southeast went over .500 twice; the Northwest and the Pacific each went over .500 five times; the Central had six over-.500 seasons; and the Southwest, home of the Texas Triangle, has been over .500 every year, including two seasons over .600. The 2009-10 Atlantic Division actually holds the worst winning percentage for a division in NBA history: .385. Last December, that mark looked threatened as the Atlantic dragged its bedraggled carcass out to a .314 start, before a midseason surge from the post–Jason Kidd power-grab Brooklyn Nets pushed the division’s percentage up to meager .421. This season, the Raptors are 16-6, acting as the artisanal whipped cream and freshly picked cherry atop the trash-fire sundae of Nets, Celtics, Sixers, and Knicks. Cumulative winning percentage of the non-dinosaur-branded Atlantic Division teams: .259. We’re one Kyle Lowry slip in the shower away from making NBA history. So how did we get here? Let’s take a quick look back at some of the lowlights from the last decade of the Atlantic Division. The Celtics were 16-20 after a loss to the Raptors in the middle of January, when Paul Pierce semi-accurately summed up the Atlantic Division as “the worst in NBA history.” Not yet, Paul! In January, the New York Times ran a story about the newly realigned NBA with the lede “This season, the Atlantic is not a division, it is a subtraction.” The Celtics would eventually steady the ship down the stretch, going 24-17 after the Raptors game in January, and notching signature wins against the Mike D’Antoni–Steve Nash Suns, the Lakers, and the reigning NBA champion post-Malice Pistons in double OT. The Celtics finished 45-37 to win the Atlantic Division crown, which is still the lowest win total for an Atlantic Division champion since the division’s inception in 1970-71. The C’s would then go on to lose to the Pacers in seven games in the first round of the playoffs. The series featured Pierce getting ejected in the waning moments of Game 6, with the Celtics up by one, for elbowing Jamaal Tinsley in the mouth after being fouled intentionally. 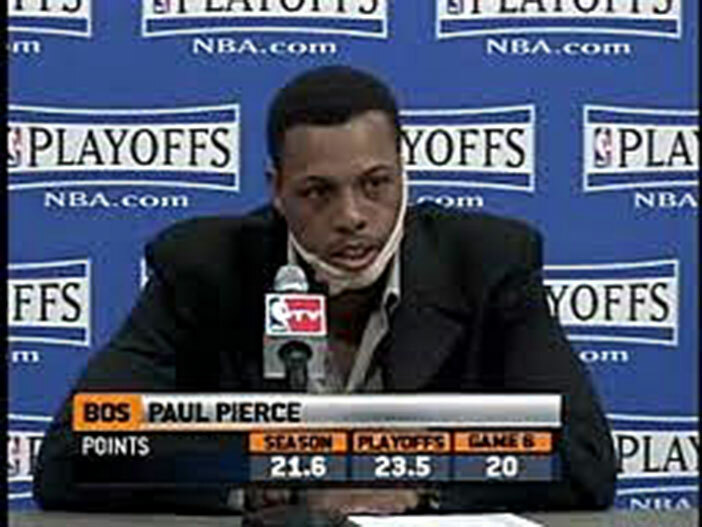 Pierce then went to the postgame press conference with his lower face and neck crudely wrapped in bandages, saying ish like, “This is because I got my face torn off on the last play.” You crazy for this one, Paul! Three years later, Pierce would win an NBA title and is now rightly viewed as a sage and skilled veteran assassin with championship experience. Never let anyone tell you that a player’s reputation can’t be salvaged. Atlantic Division winning percentage: .415. Everything that could go wrong for a professional basketball team did go wrong for the New York Knicks during the 2005-06 season. The Knicks’ top scorer and once-upon-a-time playoff hero, Allan Houston, was forced to retire due to knee injuries. Houston had missed 94 games over the previous two seasons after signing his infamous $100 million, six-year extension in 2001. The caption under the picture of Houston on an ESPN.com story about his retirement reads: “Allan Houston will be remembered for his shooting ability, his character, and a nine-figure contract that crippled the Knicks.” Head coach/wandering nomad of righteousness Larry Brown went from declaring the Knicks his “dream job” to openly and acidly feuding with star point guard Stephon Marbury and allegedly pushing for the acquisition of Steve Francis. The team was $74.5 million over the cap, won just 23 games, and had to watch its 2006 draft pick go to Chicago (which used it to select LaMarcus Aldridge second overall) as a result of the Eddy Curry trade the previous season. Atlantic Division winning percentage: .385. The Nets did not win their first game until December 4, and shot out of the gate to a blazing 0-18 record, the worst start in NBA history. Home games were played at the wasteland-like Izod Center, a.k.a. “The Swamp,” which the Daily News labeled the “NBA’s most forgettable arena.” This was the Nets’ last season at the Izod Center ahead of their planned move to Brooklyn by way of Newark, and that, coupled with the desultory product, created a consistently apathetic and occasionally surly in-arena atmosphere. The spiritual peak of the season occurred during a March loss to the Miami Heat that dropped the Nets to 7-63. 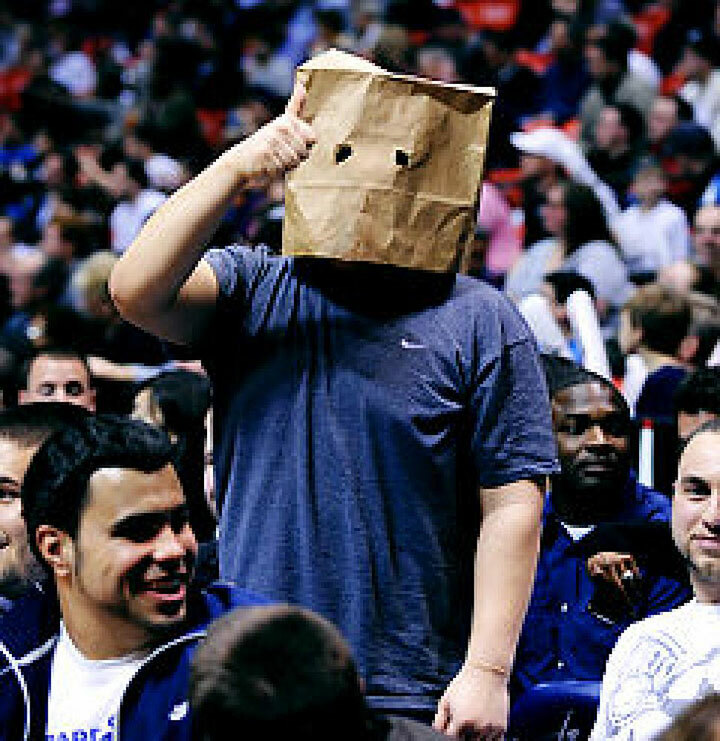 During the lull between the third and fourth quarters, Nets CEO Brett Yormark began berating a courtside fan because the fan was wearing a paper bag on his head. The fan responded in the most American fashion possible, pulling his Nets tickets out of his pocket and waving them at an enraged Yormark. “At first I didn’t know who he was, and he said he was the Nets president,” the fan said. “I thought, ‘Wait, Rod Thorn is the president. He’s lying.’ He asked why I had the bag on, and I was sarcastic that the Nets were so good. Then he said something he shouldn’t have.” WHY ARE YOU WEARING THAT PAPER BAG? BECAUSE THE NETS ARE SO GOOD, BRO. Yi Jianlian started 51 games for this squad. The Nets would go on to finish 12-70, winning three of their last 10 games to avoid tying the 1972-73 Sixers for the worst regular-season record ever. Atlantic Division winning percentage: .422. Sam Hinkie’s first full season as Sixers GM brought us, and the Atlantic Division, the full weight of modern tanking in all its intricately planned, vertically integrated, purposeful badness. The Atlantic, as we’ve established, has seen its share of bad teams. But that was all mostly badness of the inept sort. The Sixers under Hinkie would innovate in the smart-bad space, hoarding assets, dumping long-term money, and treating draft picks like mutual funds. The team’s best players were traded away for scrap. Seven of the 23 players who played for the Sixers last season went undrafted, and many had spent significant time in the D-League. The team played at the quickest pace in the league — 99.2 possessions per 48 minutes — to maximize the ineffectiveness of its league-worst 99.4 offensive rating. The Sixers led the league in turnover percentage (14.8) and had the highest opponents’ eFG percentage (.524). They gave up the second-most dunks (356, or 4.34 dunks per game) and the fourth-most layups (989, or 12 per game) in the NBA. The 2013-14 Sixers gave up about 32 points per game just on dunks and layups. In other words, it all went according to plan.